Home » Novità - News!! 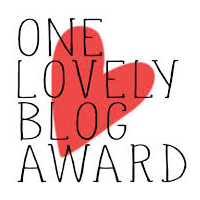 » One lovely blog award! Controllate se vi ho taggati!!! Check if we chose you!! Grazie mille per aver pensato a noi!! This is our first bloggers’ award and we are REALLY happy to thank Max510’s and The blog around the corner their wonderful blog that, as our, talk about travles and life!! 1. Ringraziare e linkare 😉 la persona che ti ha nominato: fatto! 1. Thank and lonk back to the person who nominated you: Check! 2. Elencare le regole e condividere il premio: fatto! 2. List the rules and display the award: Check! 5. Segui, se ancora non lo fai, il blog che ti ha nominato: fatto! 5. Follow the blogger who nominated you (if not already! ): Check! adesso vado a curiosare tra quelli che avete scelto..